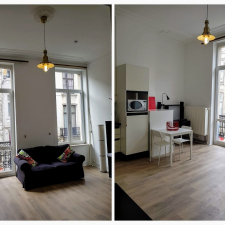 Renovated, furnished 45m2 one-bedroom apartment for rent, situated halfway between trendy Place Flagey and Place Fernand Cocq (Rue du Collège, 15min walk to European Parliament). Quiet and very bright, with high ceilings and parquet, small balcony facing south-west. Living room (couch, desk, table, chairs) with American equipped kitchen (cooker, fridge/ freezer, microwave/ oven, coffee machine, cooking utensils and dishes, washing machine), 1 separate bedroom (double sized bed, wall closet), 1 bathroom (with bathtub) and 1 separate WC. Gas heating, double glazing,interphone. Available immediately. Minimum lease 1 year. Deposit 2 months rent. Smoking only on balcony. Rent: €750 per month including water and all common building charges, plus a provision for electricity and gas of €50 per month. email: appartabxl@gmail.com, mobile: +32 498 35 36 65.